Green Check reduces the time, cost, and risk that comes with managing your business’ compliance program, letting you focus on what matters. Gain visibility into your sales data and see how much of your cash is bankable. Our always up-to-date compliance guides and rules engine help keep you compliant, even as laws change. Build a detailed history of regulatory compliance to show to banks or auditors. Green Check integrates with your point-of-sale (POS) system. Green Check allows you to choose the right banking partner for your business. Our Compliance Rules Engine verifies your sales data and highlights any anomalies. Discover opportunities for maximizing your verified cash revenue. Quickly schedule cash deposits with your bank or credit union. Our Compliance Guides put the most up-to-date regulatory information at your fingertips. Green Check works within the financial industry, not around it. 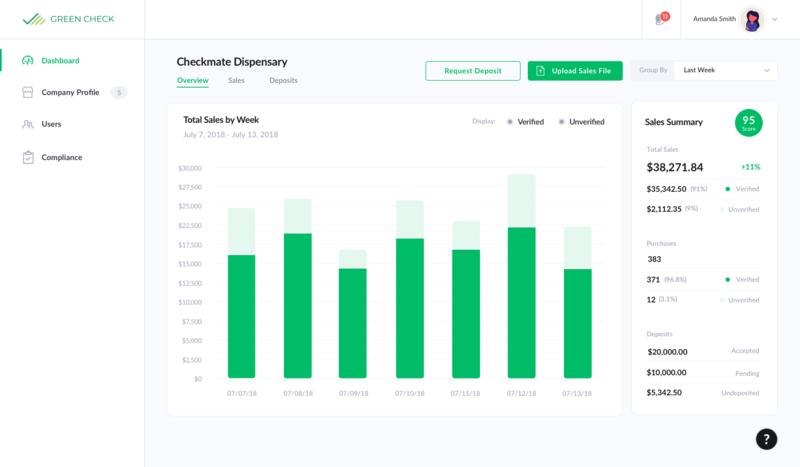 Our vision is to enable cannabis businesses to access the same banking services every other industry enjoys. Schedule a demo to see how Green Check can take the stress out of managing your company's compliance. Made with ❤️ in New Haven, CT.